Abridged translation by Ton Tielen: 'living at de Lange Houtstraat'. 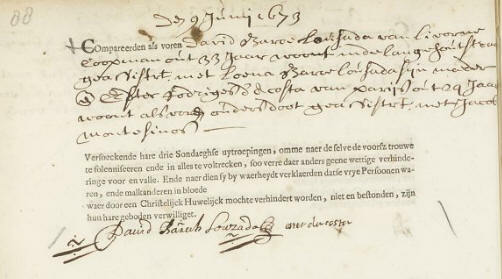 Abridged translation by Ton Tielen: 'living in Swanenburgherstraat and his mother-in-law to be living in Madrid'. The text actually gives the mother in Spain but of course Madrid is a reasonable inference. Note previous wife's name shown in the summary above.